Members are: IVANA BRITVEC (CMS Biathlon), NENAD GORICKI (RANK 1 Biathlon), DALIBOR VICEVIC (RANK2 Biathlon), ZELJKA SUNJOG (RANK 1Biathlon) later joined TOMISLAV VARGA and ALEKSANDRA BARJAKTAR. - First competition that was held in Ljubljana SKC centar in 2009 Ivana Britevc and Ivan Jurkovic were representing Croatia, Ivana won 2nd and Ivan 7th place. The results that Ivana made was that time best and only results for Croatia. Ivanas results was great stimulus for others to try kettlebells and later try to compete in girevoy. These were the beginings for Croatian girevoy sport . - After that competiton in Slovenia, team met Gregor Sobocan Master coach, and master of sport, who was willing to prepare team for LC competiton in Zagreb. This was the first competiton held in Croatia in organization by WKC and Gregor Sobocan. Under the Croatian flag there was 6 competitors and all did very good. Team from USA Chatrine Imes, Sara Nelson, Surya Voiner-Folver, Finland Kukka Lakso, Slovenia Tajda Sobocan, Mateja Legan, Norway Thierry Sanchez, UK Katarina Helcmanovska, Germany Joachim Barth attended also. 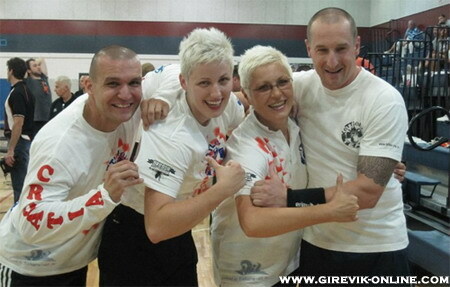 - Next challenge for Giryatrija team was WKC World Championship in Chicago in August 2010. Team was good prepared and won 4 gold medals each in own category. This was the first big result for Giryatrija team and Croatia. Ivana Britvec CMS , is head coach of Croatian girevoy spot association. - EGSA is a new association created with one goal - joining European countries and their athletes, coaches and Girevoy Sport enthusiasts under one organization, one set of rules and one ranking system. The idea is to provide an environment in which individuals can advance as fast as their effort implies by training with experienced coaches who have proven their expertize and actually competed in Girevoy Sport on highest level. - Giryatrija team together with EGSA and Gregor Sobocan is organizing a LONG CYCLE competition, Pisarovina - Croatia open on 8th January 2011. All are invitined!